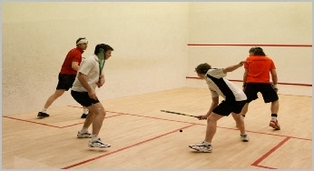 Abingdon Squash and Racketball Club is both a member owned club and a community amateur sports club and it prides itself in its reputation of being the top squash club in Oxfordshire. The club which is well establised has been in existence for over 40 years and has been the home club of British champion players such as Mark Cairns. There is a very strong junior section with some juniors playing at National, Regional and County level. Ben Rosec, the Club Professional organises weekly junior club nights and coaches on the Future Stars program. Ben is at the club every day and offers high quality coaching for adults and juniors on an individual basis at very competitive rates. 4 courts including a glass backed exhibition court. A members bar area with free WiFi. Courts can be booked at the club or via an on-line booking system with discounted prices for off-peak booking. Monthly squash and racketball box leagues. Regular competitions such as the 2018 Closed Championships. The club is available for use 24 hours a day.